You will meet your tour guide in Berlin at the Olympic Stadium. You'll begin by seeing some of the sights of former West Berlin. 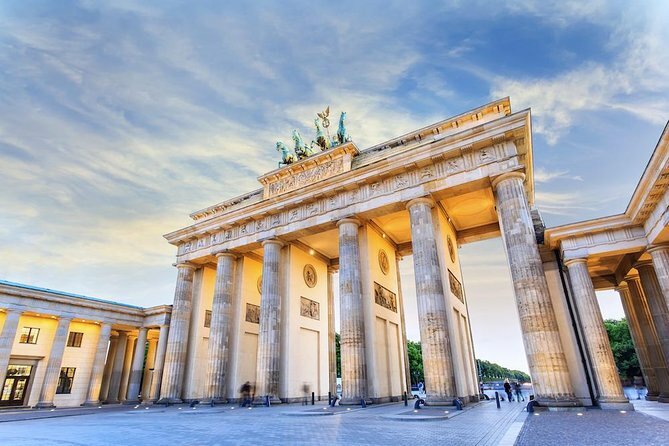 You'll continue your tour of the former West Berlin by visiting Kurfurtsendamm and the Kaiser Wilhelm Memorial Church – a chilling yet inspiring reminder of the consequences of war. As you make your way east, you will drive through Tiergarten, Berlin's central park. At the center of Tiergarten stands the Siegessäule (Victory Column). Built in 1873 to commemorate Prussian military victories against Denmark, Austria, and France. At the end of the park, you will get out and see the Reichstag. This building houses today's German Parliament and it was the seat of the Imperial Diet and the Weimarer Republic until 1933, when it was severely damaged after being set on fire. Afterwards, you will walk to the Brandenburg Gate. A symbol of Berlin and German division during the Cold War, it is now a national symbol of peace and unity. A brief walk through Pariser Platz and you will be visiting the solemn memorial to the Murdered Jews of Europe. On the way to lunch, you will drive by the location of Hitler's Bunker. After lunch will be more sights from East Berlin, beginning with Potsdamer Platz. Totally destroyed during World War II and bisected by the Berlin War during the Cold War, Potsdamer Platz is a stunning reminder of the urban renewal after Reunification. Afterwards, you will visit Checkpoint Charlie. The iconic border crossing point between East and West Berlin. You will also drive by Gedarmenmarkt, which features the Concert House Berlin flanked by the French and German churches. Just south of Gedarmenmarkt, on the southern end of Unter den Linden, is Bebelplatz. Here is the sight of one of the most infamous Nazi book burning ceremonies. Driving further down Unter den Linden, you will see Neue Wache. Previously a guardhouse for the troops of the crown Prince of Prussia. It now serves as the "Central Memorial of the Federal Republic of Germany for the Victims of War and Dictatorship." A natural island in the river Spree, Museum Island is home to 5 internationally renowned Museums, built between 1824 and 1930. The museums themselves illustrate the development of modern museum design and its collections span six thousand years of human artistic endeavour. The Berlin Cathedral finished in 1905 is a prime example of German imperial architecture. Named after Tsar Alexander I, Alexanderplatz was the heart of East Germany and remains Berlin's eastern center. Amongst the sights to look out for here are the 365 meter TV Tower, Berlin's highest construction topped by a globe with a rotating viewing platform, and the Rotes Rathouse, Berlin's town hall and home to the governing mayor and the government of Berlin. Your tour in Berlin will end at the Topography of Terror. This outdoor and indoor museum located on the site of the Gestapo headquarters is a tangible reminder of Germany's Nazi past. At the conclusion of the tour, the groups will reconvene and go back to their original transfer buses, and then depart back to the port. Bathrooms Virtually all public restrooms in Germany will require a 0.50€ coin to use. Please bring some with you. Berlin is still largely cash only! Restaurants and stores (including most souvenir stores) in Germany will accept cash (EUR) only. They will not accept foreign currency, and they will not accept credit cards. To pay for lunch, you must have cash EUR. Sometime before the lunch break, the tour guide will show you to an ATM where you can get EUR. Itinerary is approximate. While we will try and visit everything, traffic conditions, local events, and crowds, can sometimes prevent some sights from being visited. The order in which sights are visited may be adjusted for optimal visitor experience. For your own comfort, please consider bringing comfortable shoes, bottled water and some snacks for the long day.